A June villa holiday kick-starts your summer! Get your fix of sunshine and top up your tan in an alluring sun-kissed destination. Look on in awe as inviting beaches meet turquoise sea. And with much to discover beyond the beach, delve into the local treasures and hidden coves for a holiday of relaxation and adventure. See our top picks for June, including some Mediterranean wonders. Where will your June villa holiday take you? This southern Spanish treasure literally translates to ‘Coast of the Sun’. Costa del Sol is home to some of the most fabulous beaches you’ll ever set your eyes on, and is a treat for all the senses! Immerse yourself in Spanish traditions which are kept and celebrated throughout the region, from Flamenco dancing to lazy siestas in the afternoon sun. You’ll feel the Spanish vibes as soon as you step off the plane. Costa Del Sol’s coastline has some of the best weather in Spain, consistently enjoying delightful sunshine which is perfectly complemented by a light breeze flowing from the Mediterranean. Top up your tan and enjoy temperatures of up to 28°C in June! Witness the sparkling harbour of Marbella, or the intertwining streets of Benalmadena’s Old Town. The area boasts many resorts scattered along the Malaga coast, all offering something unique for any taste. You’ll be spoilt for choice! Whichever homely villa you choose as your base, you're never far away from another exciting bar or tempting beach - especially if you opt for car hire, which opens up a world of possibilities for your Costa del Sol adventure. 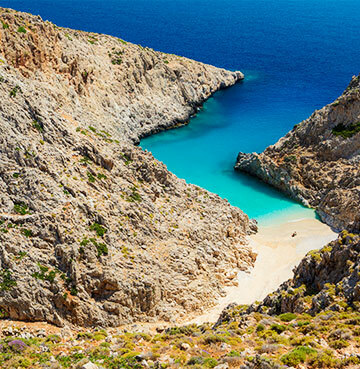 As Greece’s largest island, Crete is home to a captivating selection of glistening beaches, intriguing historical sites and bustling towns. It's made a name for itself as an alluring holiday destination, while still proudly displaying treasured Greek traditions. Its architecture and culture will leave you feeling inspired. Alongside its mesmerising coastline, you’ll witness the striking natural beauty of rugged hills and rising cliffs, overlooking little sandy coves dotted in corners of the island, just waiting to be uncovered. This is perfectly met by an array of mouth-watering Greek cuisine served up in local eateries. In June, enjoy a delicious bite of meze overlooking a glistening coastline in temperatures of up to 27°C. Take your pick from over 60 villas across this irresistible Geek island. Picture the orange and red hues of rustic terraced Croatian buildings meeting the deep blue ocean in a clash of colour. Istria is a dream for the eyes as well as the mind. Based in the north west of Croatia, it sits on its own peninsula with colourful shoreline views fit for a postcard. Historic buildings sit proudly overlooking rocky inlets. Classic boats bobbing on the surface reflect the rich Croatian culture which flows throughout the streets. Pula, Rovinj and Porec are just some of the quirky towns which give Istria its unique feel. Inland, rural farmers produce a selection of wine and olives served up at nearby eateries. Maybe you’ll spend time meeting the locals who’ll cook up some tasty gourmet dishes just for you. Savour these in traditional konoba (taverns). In June, the area shines in temperatures of up to 22°C, an idyllic climate for those who prefer to unwind in pleasant warmth rather than higher humidity.